Shooting roller girls is always fun, but usually they’re whizzing past me at breakneck speed and merrily knocking lumps out of each other. So for a change if pace I like to drag them into the studio and shoot them on the dark where they can’t move as fast. It’s a bit like putting a hood over a falcon. 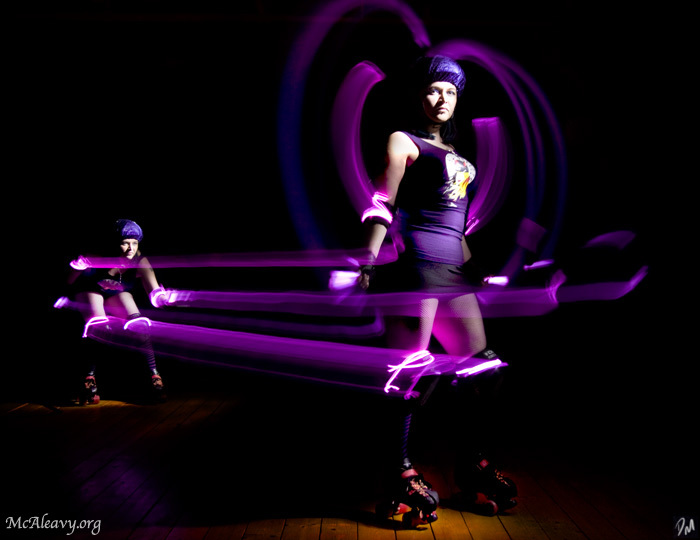 This week I had the great pleasure of shooting Venus Velocity from the Glasgow Roller Girls. We decked her out in purple electroluminescent wire (she likes purple) and, ably assisted by my friend Sharon, she wheeled around the shot I had in my head – and nailed exactly the look I wanted. I’m really loving this stuff, so watch this space for more roller girls soon.